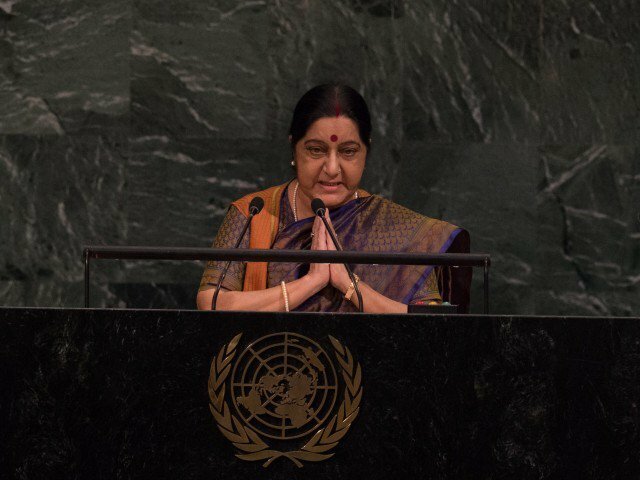 India Minister of External Affairs Sushma Swaraj addresses the 72nd Session of the United Nations General assembly at the UN headquarters in New York on September 23, 2017. In response to Prime Minister Shahid Khaqan Abbasi’s address at the UN General Assembly in which he renewed the offer for dialogue with India on all thorny issues, India’s External Affairs Sushma Swaraj said on Saturday Narendra Modi has always sought dialogue and peace but Pakistan has turned its back on the offer. “Mr Modi, “from the moment he took his oath of office, offered the hand of peace and friendship [to Pakistan],” Sushma told the UNGA. Pakistan must answer why it spurned this offer, she added, according to The Hindu. Sushma said India and Pakistan have mutually agreed to resolve all issues bilaterally, in the Shimla Agreement and the Lahore Declaration. Pakistan, she said, had allowed the joint decision in 2015 to have a “Comprehensive Bilateral Dialogue”, which was proposed by former PM Nawaz Sharif. “Pakistan is responsible for aborting that peace process,” she alleged. Sushma said Pakistanis should look at the progress India had made since the two countries emerged on independence from Britain in 1947. On Thursday in New York, PM Abbasi had also urged the UN secretary general to appoint a special envoy for Kashmir and accused India’s military of brutality in a crackdown against anti-India activists. He said hundreds of Kashmiris had been killed or injured and shotgun pellets have blinded and maimed others. “This dialogue must be accompanied by an end to India’s campaign of subversion and state-sponsored terrorism against Pakistan, including from across our western border,” he told the world leaders attending the 72nd General Assembly session at the UN.